While I was interviewing with the good folks at Adventure Cycling, one person expressed his concern that I seemed to be very mountain-bike-centric, while the bulk of their organization was dedicated to road touring. I pointed out that my roots in bicycle travel - and, indeed, my roots in cycling itself - were firmly planted in the pavement and panniers culture of the open road. And today, while sorting through a box of old photos in my latest effort to purge, I found picture proof: Standing on the banks of the Colorado River near Moab in September 2002, just before embarking on a 600-mile loop tour of Southeastern Utah and Southwestern Colorado. I love finding (and making fun of) old photos of myself. For starters, I have no recollection of owning that jersey and can't fathom where I obtained it, but I do hope it went straight to the trash can after that trip. Secondly - zip-off pants? Really? Thirdly, I bought that Bell handlebar bag at K-mart and I still own and use it. Fourthly, four panniers and a tent and tarp strapped to the rear rack? Who needs all that stuff? 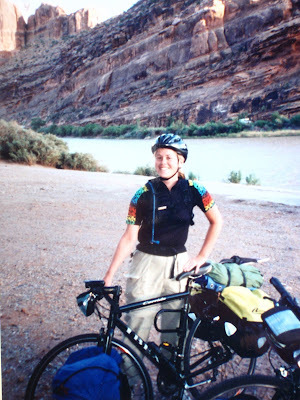 Fifthly, that was the first time I had ever traveled fully loaded and I still vividly recall the 35 miles we pedaled out of Moab as one of the toughest days of riding in my entire life. Seriously. It's still right at the top in terms of end-of-day shock and fatigue. But the fact that I managed to rally for the next 565 miles proved to me that determination runs deeper than physical strength. On that note, I'm taking off for a short tour of my own on Tuesday, but I wanted to write a quick post about this year's Tour Divide before I go. This year's race begins Friday morning in Banff, Alberta. Forty-eight people have committed to starting this year, including four women. I'm sure at least one of those women is going to absolutely shatter my TD race record, but it was fun to hold it for a year. Many people have asked me if I feel envious or sad that I won't be lining up for the Tour Divide this year. My answer is a genuine "no." Even before I started planning this huge move and job change, my head has been far away from the needed discipline and desire it takes to embark on a long, solo grind across the Divide. I have really enjoyed my unstructured time to have random adventures, and not having a big event on the horizon gives me the freedom to do what I want - go for a hike or join a group for a leisurely ride, rather than put in hours and hours of necessary training miles. I'm not saying I'm never going to train for anything epic again, and I'm not saying I'd never ride the Divide again. It remains one of the most incredible, self-affirming experiences of my life. But for now I'm content to do my small stuff and enjoy an armchair-adventurer stance in this year's race. 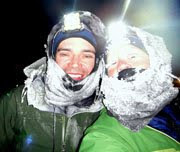 Race updates will be posted starting Friday at www.tourdivide.org. If you're interested in reading more about the experience of riding the Divide, Eric Bruntjen put together a collection of Tour Divide stories, interviews, poems and photos in a book called the Cordillera. I actually have not had a chance to order it yet, but I contributed a chapter for the project (full disclosure: it's an excerpt of a book I am working on.) The proceeds from the Cordillera actually go to Adventure Cycling, which I'm all for, since I'm going to be joining the payroll soon. It's a vintage Adventure Cycling map, from my Salt Lake City-to-Syracuse, N.Y. tour in fall 2003. We actually only followed a small portion of this particular map, dropping into the route about 100 miles west of the Missouri-Illinois border. 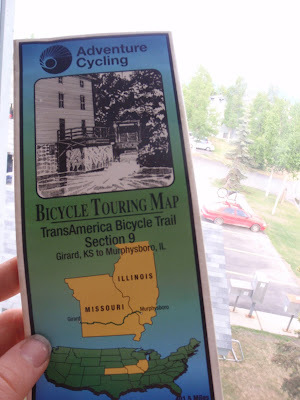 Finally joining Adventure Cycling's TransAmerica route basically saved me from calling it quits on the cross-country tour, because in northern and central Missouri we found nothing but narrow roads, nonexistent shoulders, heavy traffic and belligerent drivers - i.e. "Misery." The TransAmerica route took us to our saving grace of farm roads and bicycle-friendly towns. I finished that trip happy and hooked on bicycle touring. Now I have a whole set of Great Divide Mountain Bike Route maps still caked in mud. Adventure Cycling really does do good work. ...one person expressed his concern that I seemed to be very mountain-bike-centric, while the bulk of their organization was dedicated to road touring. Ummm, did you let this person know how few miles you had access to over the past few years? Jill...just a guess here, but I think you're going to LOVE Montana (I'm from Helena). Missoula huh?? Well, it's probably the BEST spot in the state that I can think of...IF I were to return to MT that's where I'd pick. It's smack in the middle of SO MUCH awesome outdoors! Sits in a little pocket of pretty awesome overall weather. Sure you will miss AK, but totally new adventures await! And good luck w/ the new job...AC will be picking up loads of new customers I'd think. 2002 huh? Do you realize you were the same age in that picture that I am today? Definitely won't be embarking on quite the same adventure as you did then. You are not becoming boring...you are happy and excited and you earned it the hard way, questioning your life and making real changes! Hooray. I love it that your fondness for mountain biking was questioned in a job interview...sure, I understand why, but it's just that you were interviewing for a paid job for which this actually matters! Still so happy for you! Liked your blogs from Southcental AK. Great stuff! I don't know Anonymous, probably a gutless wonder thus anonymous. AC (Adventure Cycling), pavement centric...maybe you are just what they need. For some reason I 'see' you expanding their horizons. Does it really matter whether you tour on mt. bike or road bike? It's a great adventure either way...sounds a little roadie elitist to me. only if weather allows will 24days go down. good luck in MSO! My name is Sammy Rodriques and I work for a company called Gearpods. I recently tried to contact you via email and haven’t heard back from you since. I am wondering if your account is still active? I sent it to jillhomer66@hotmail.com. If this was an incorrect email address please let me know because I think that you specifically would be very interested in our product seeing as how you have such a background with bikes! Basically in the email we sent we just wanted to see if you were interested in some samples, but that will be further explained in the email. Thank you for your time and consideration! If the people at Adventure Cycling were smart (and I'm betting they are), they would embrace your cycling diversity, and encourage you to write about riding dirt. It can be fire roads, gravel roads, forest roads… if the word "road" makes them more comfortable. I bet their audience would appreciate another viewpoint on the wonders of two-wheeled travel. After all, is there any greater cycling adventure than tour divide? Congratulations on the great new job, and I'm looking forward to hearing much more about Montana, one of my favorite places ever. Hey, in the picture Jill posted, is that a dog or a bear in the rocks behind her? You have to use your imagination a little, but just a little observation. Wish you would have been in Missoula when I passed through AC hdqr in '07. I bet you fit right in and find some awesome riding in the area......and beyond. Enjoy the next phase of your life. Awesome especially because you've found something you're PASSIONATE about. Excellent.